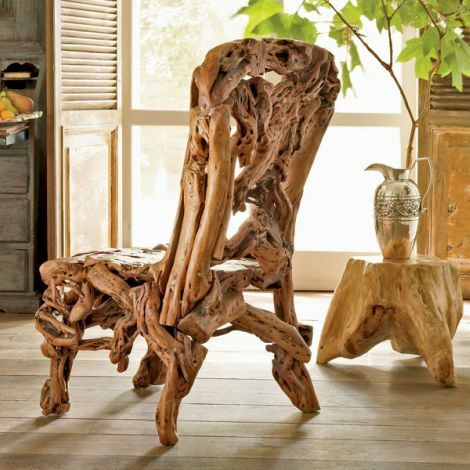 feast your eyes on this stunning azalea wood chair! some varieties of azalea plants have beautiful contoured branches, and are frequently used to keep orchids upright in their pots. their flowers and leavesÂ (really the plants in general) are typically smaller than their rhododendron cousins, so by looking at the thickness of the branches, you can only imagine how large these shrubs must have been. hey! someone left their tree in my living room! if someone left that in my living room, i would be pretty pleased! stunningly rustic, but i am a little fearful that if i sat there it would come to life and swallow me whole. and thanks for adding me to your blogroll good buddy! Looks awesome, kind of Lord of the Ringsish. my pleasure sosser pal. i suppose it does look a tad formidable! yeppers, i think it is LOTRish too — good call! to quote meat loaf, you took the words right out of my mouth. Stunning, but I wonder would it be comfortable to sit on?? thanks for the comment! you have a good point. the dimensions are 22″w x21″d x37″h, so it seems to be a generous size. ai feel this is the nicest piece of creativity I have seen in a good long while. I would like to have some way of contacting this obviously very gifted artist personally for professional reasons! i wish i knew the name of this artist. he/she does wonderful work! this chair is the real thing. mine is beautiful and the weight is the heavist that i have ever picked up. i don-t actually know the weight but i may have it weighed. thanks wisteria for this rare product.